Make your Raspberry Pi sing with Volumio #piday #raspberrypi @Raspberry_Pi « Adafruit Industries – Makers, hackers, artists, designers and engineers! Here’s a brief tutorial and review for using the free and open source audiophile operating system Volumio for embedded computers, in this case a Raspberry Pi. You can also use Volumio with BeagleBone Blacks and a few other SBCs so far. In the shared office space where I work, there’s an old 2nd generation iMac that we use to play music. It’s hooked up to a decent set of speakers, and plays music from the web or the local network. Over the last couple of years though, software support for non-intel Macs has all but disappeared, so we’ve been looking for alternatives. Enter Volumio. The idea is really simple. Volumio transforms a Raspberry Pi computer into an audiophile music player. Simply install it onto an SD card, put it into the Pi, and you’re good to go. 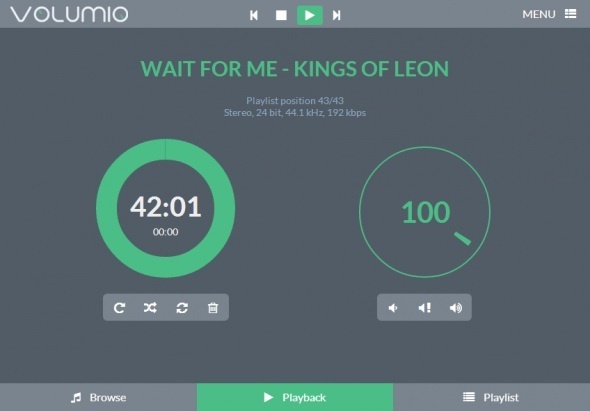 Setting up your Pi as a Volumio music player is dead easy, and the project’s website has documentation to guide you though the steps. On the Raspberry Pi, Volumio’s main limitation is the analog audio jack on the Pi. It’s wasn’t engineered with audiophiles in mind, and you can tell. But worry not, Volumio supports a wide range of DACs (Digital to Analog Converters). For around $30, you can get real hifi from your Pi. Another potential bottleneck is the Pi’s slow CPU. I logged into my “first batch” 256MB Raspberry Pi, and found it at 30-40% load while playing a web radio station. Not too bad. Regular “CD Quality” MP3s should play without issues, HD audio might be tricky….